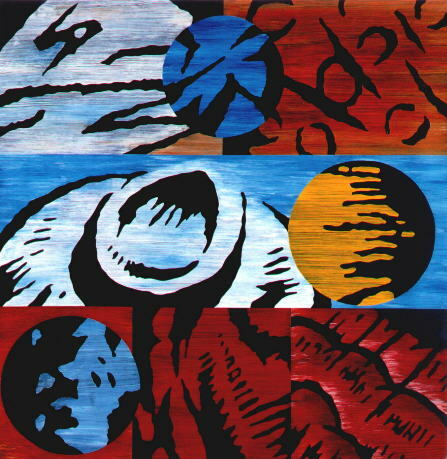 In many ways, Mark Staff Brandl is a compendium of everything postmodern: a painter at a time when painting is "out," an artist who is also a practicing art critic, and a mixer of high and popular art forms. The American artist‘s work will be on display in January and February at the Kunstraum museum in Kreuzlingen, Thurgau. 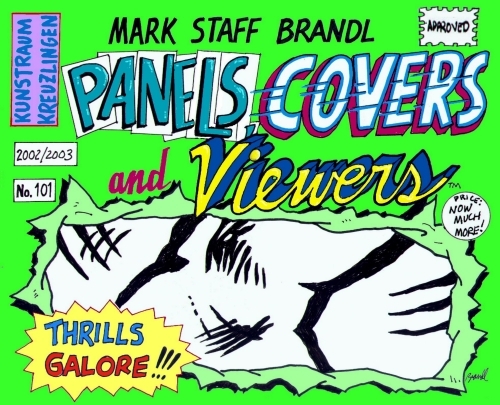 Trying to categorize the work of Mark Staff Brandl can be a difficult task. "Painting is out," he says, at least according to the majority of the world‘s curators, who spend most of their time in search of the next best video installation—"for the curator today, everything‘s video." But painting is exactly what Brandl does. And the confusion does not stop there. 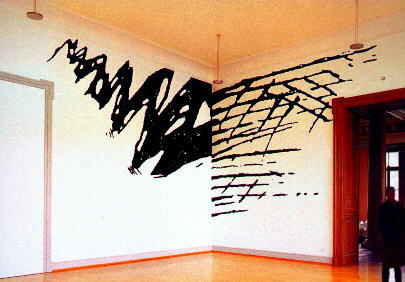 Even within the domain of painting, there is no definitive term to describe his art. He does installations, but they always involve painting—usually on a wall or the ceiling. A self-proclaimed "neo-conceptual visual artist," Brandl combines abstract concepts with concrete representation, although to the layperson‘s uninformed eye, much of it might remain strictly abstract. And to top things off, he is also an art critic whose written work has appeared in numerous English and German language magazines and critical journals, a "dual mandate" which is the source of much more controversy on this side of the Atlantic than it is State-side. But it is his theoretical background which makes the difference in his work. As a "critical" artist, Brandl‘s is as much a cerebral effort as anything else, truly lending meaning to the term artistic "approach." Perhaps the most telling aspect of Brandl‘s approach is his combination of high cultural theories with pop cultural form. Unsure about the difference between the two? Then picture staging an episode of the Batmanon Shakespeare‘s Elizabethan stage. Or more to the point: picture staging an episode of the Batman in a Berttolt Brecht rendition of a Shakespearen play. In our postmodern age where "anything goes," the lines between what is art and what is not has been blurred to the point that many viewers are left with the all-too-often-cited feeling that, "Hey, I could do that—that‘s not art!" But forBrandl, and indeed for many of the world‘s leading artists, this is no reason to turn one‘s back on an artistic trend that started more than 30 years ago. After all, "there are certainly lots of people out there who ‘could’ create the likes of Andy Warhol‘s famous silk-screen 10 Marilyns or his famous Cambell‘s soup can reproduction, but they didn‘t do it at the time, and they‘re not doing it now. Anyone can say that they could create a piece of art after it‘s been produced and celebrated. But art isn‘t just about technical ability—there‘s obviously much more to it than that," he says. It‘s a fine line for Brandl, who, like many of his contemporaries, insists on his right to make high cultural demands while sampling from a postmodern, pop cultural palette of possible forms. For it is precisely the appeal of popular culture to which Brandl finds himself yearning to return, or at least revisit. "I grew up with Superman and television superheroes, and all that stuff. I can‘t deny my past and I don‘t want to," he says, referring to one of his more recent paintings, Shuster in Madrid. Shuster in Madrid exemplifies Brandl‘s savvy at combining high cultural theory with pop elements. The process by which his work is "born" involves the theoretical conceptualization of essentially pop cultural material. At first glance, it is hard to decipher just where Madrid could be said to be present in the painting, while the Shuster reference seems to come straight out of left field, leaving one to pose the question as to how such a painting might qualify as a piece of "popular" culture. Brandl‘s "method" reveals the answer to this and many other questions. First of all, a little historical background: Joe Shuster was one of the creators of Brandl‘s childhood comic book hero, Superman, accounting for the Shuster reference. As for Madrid, if you set out in search of some famous cathedral or bull-fighting ring, you wouldn‘t get very far. Madrid is the "frame" of the painting. Here‘s how it works: once on a trip to the Spanish capital, Brandl visits a book shop and comes across a Superman comic book, which he promptly buys and brings back with him to his idyllic farmhouse/studio in Trogen AR. Later, he does the thing he does in producing most of his work these days: using a range of electronic machines—such as fax machines, copiers and computers— Brandl blows up a page of the comic book over and over again beyond anything that could be said to be coherent recognition and then employs the final image—a "collection of mistakes," in his own words—in the production of his painting. What looks like half an avocado or an abstraction of a desert canyon is really the 1000 per cent enlargement of, say, Superman‘s shoulder, or left toe. The very structure of the painting rounds out the pop experience: composed of a series of three rows, Schuster in Madrid emulates the metonymic character of the comic strip. Put all this together and voilà, it‘s pop culture par excellence. The pop element will be even more evident in Brandl‘s upcoming exhibit at the Kunstraum in Kreuzlingen, where he will show what is in effect one massive installation, with a soundtrack, about 100 drawings and about 15 large paintings, painting directly on the wall and a collection of what he calls "covers," a series of comic book-like drawings dedicated to the theme of comic strips; there will also be "viewers" on hand, the little plastic snap in slide cameras you get as vacation souvenirs. The exhibit also marks a definitively new direction in Brandl‘s career, bringing with it a certain sense of risk as well, says Brandl. "A lot of people have told me that using comic strips could ruin my career, so I‘m taking a big chance." But Brandl is determined to march on, comics in hand. 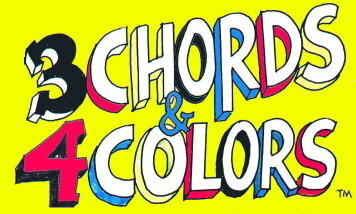 One of the "covers" best captures the spirit of Brandl‘s new direction: "3 Chords and 4 Colors." The chords refer to the Beatles numerous masterpieces all based on three musical cords, the colors a mere reference to the 4 primary printingcolors of red, blue, yellow and black. "It‘s sort of like getting back to my roots, the reasons why I got into painting and art to begin with. The Beatles, basic chords, basic colors, the nascent stages of my artistic career. Comics had a great impact on my childhood and now on my art," he says. But, considering Brandl‘s attitudes about the role of the artist, risk is the only way for him to develop his artistic craft. "Many late and post- Modernists are scared to death of their masters, the big names of the past, and subsequently avoided confronting them. But the artist should not simply stand in awe of his master the way they do—he should try to kill him. It‘s like the story of Jacob in the Bible: the name ‘Jacob’ meant something like ‘fraud’ or ‘fake,’ but when Jacob had the guts to confront God, God changed his name to ‘Israel," or ‘he who fights God.’ That‘s what an artist should do—he must confront his master and try to kill him in order to overcome him— and thereby show respect," Brandl says. Just who his "master" is remains unclear, and whether the Biblical analogy is fitting is also questionable. But if those skeptical voices are even half right about the implications of his upcoming exhibit, it‘s not a bad attitude to take. Mark Staff Brandl was born near Peoria, Illinois, about 3 hours south of Chicago. He received a Bachelor in Fine Arts at the University of Illinois, Urbana-Champaign and later completed a Master of Arts program in Literature, Art History and Theory at Columbia Pacific University and has just entered a Ph.D. program in literature at the University of Zurich. Brandl‘s current work reveals that cartoons and comic books have had an influence on his artistic development, but other major influences include Marcel Duchamp, Francis Picabia and the Dada movement, to which he says he has a "love/hate" relationship. Since 1980 Brandl has exhibited his work all over the world and continues to write for a number of art journals. He now lives with his wife, 2 dogs and 2 cats in an old, rustic farmhouse in Trogen, Appenzell-Ausserrhoden, near St. Gallen, where he also maintains his art studio.